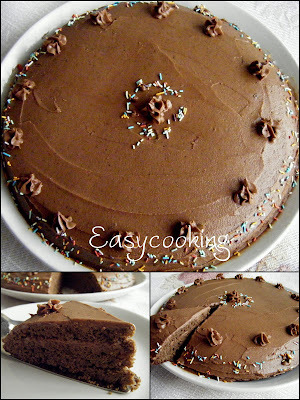 Easycooking: Chocolate Cake ~ I ♥ it!! 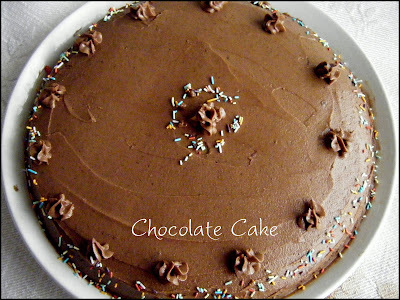 Chocolate Cake ~ I ♥ it!! I get quite a few mails asking me for eggless cakes and muffins recipes.They also want to know what I prefer,those with eggs or eggless ones.So here,let me spill the beans-I look for Eggless Cake recipes and bake them only when I am baking for Amma or ma-in-law.Though I don’t eat eggs,I do not mind having them in my brownies/cakes.I do not like the eggy smell in my cakes and many a times,beating the eggs well and adding good quality Vanilla extract solves the problem.Chocolate cakes usually don’t smell eggy because of the amount of chocolate/cocoa powder added but Plain cakes very often have that teeny bit of eggy smell which I somehow detect. I like it when Eggless recipes give me great results and many of the cakes I baked here are eggless. If you have no problems consuming eggs and are looking for a good cake recipe,I suggest you go for the ones which uses eggs. For plain cakes,yes-I wouldn’t mind an eggless recipe and would like to bake one-haven’t tried one yet. So all you Chocolate lovers out there..this one’s for you.Rich,Chocolatey,Moist and Decadent Chocolate Cake.I got the recipe from here. Grease/line a 9’[23cm] cake tin. Mix flour,cocoa powder,baking powder,salt,sugar and vanilla essence in a bowl. Add milk/water,vegetable oil and eggs. Mix everything together until smooth,either by hand or by using an electric mixer. Transfer to baking tin and bake for 35-45 minutes or until a skewer inserted in the center comes out clean. Mix together everything in a bowl and beat with a wooden spoon till smooth.If the mix is too thick,you could add a few tbsp milk to ‘loosen’ it,but add only if required. Level the top part of the cake with a serrated knife and the cut the cake into 2 horizontally.Fill and cover with the icing. One of the easiest cake I ever baked.As the original recipe is named,truly an easy cake to put across.I loved it that the recipe requires everything to be mixed together.Perfect for that sudden craving.But despite adding 2 tsp of baking powder,the cake did not rise much.I guess its got to do with the pan,the recipe asks to bake in a 9' pan whereas I think an 8' tin would have been sufficient.Though it did not affect the taste in anyway,the height of the cake was not so much to write home about.All in all a dark,moist chocolate cake-definitely on my bake-again list. OMG I just can't resist my temptation for the chocolate4 ake which looks choclatee and yummy. Wow... this is really a delicious choco treat.. will finish the whole cake now..
Agree with you Divya, nothing beats chocolate cake for a dessert!! Your cake looks so delicious! That's great! Looks very glorious! I would like to make it at Halloween as a treat. Thanks! 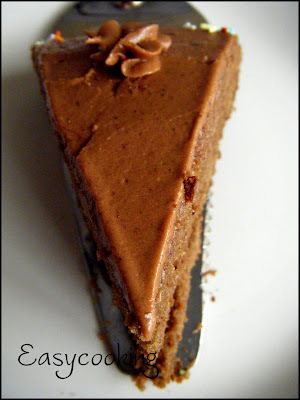 Looks decadent and yummy, perfect slice. have fun. I do like Black forest cake though. I am not a chocolate lover but it loks to me mouthwatring and yummy!! perfect presantation!!! Are you in baking spree Div? Cool ur icing is very pretty! Love the cake too! Still wonder why the eggless ones are costlier. 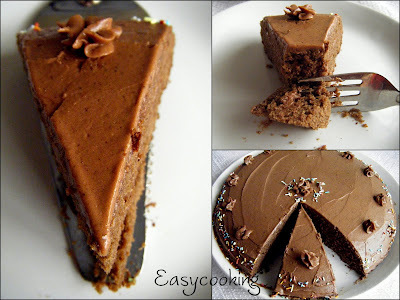 Woww awesome frosting and tempting chocolate cake irresistible!!! Looks Gorgeous Divya! Wow! Nothing like chocolate cake! looks superb..i too prefer the choco cakes when compared to the plain ones..
Hi Divya! Hope you received my mail with the Kreative Blogger Award. Please do let me know. This chocolate cake looks absolutely divine. Love it!! Wow! What a beauty. I am craving for it right now. Wow lovely cake.Such simple ingredients to make this wonderful cake. Wowo this is a beautiful chocolate cake. Wishi could grab a slice,. I have never had this, looks so so good. That does look lovely Divya. Can see so many wonderful cakes here. YUM!! I made this cake at home, (this is my first ever!) it came out quite good. Thank you for your recipe Divya!! I have an Electolux Microswave with convection/grill all features. i have tried baking cake in convection mode in borosil bake & serve glass utensil a few times but it never comes up good. It gets too crusty on the top & at bottom it remains all soggy. i saw your blog on chef in you about how to bake in microwave convection oven . So i m requesting you to help with the instructions with the time & temperature required to bake this recipe. I can refer it further to test at my end but i surely needs a benchmark to work with. WIll appreciate youe response. As i want to bake it for my hubby bday comin on 19 August. Have tried your recipe today. At 30 mins I decided to check the cake as I was getting a burning smell from the oven. To my horror the top was burnt and the inside uncooked. I am quite disappointed as everyone else seems to have had luck with this recipe. I cut the top off and baked it for another 10 mins but believe it's not worth saving. It looks beautiful and it tastes awesome. Palak Pathrodo ~ A twist to the original !! Jambool ~ A Konkani Delicacy! !